For those of you who took part in my Godzilla Quiz earlier this week, here are the Answers. How many did you get right (without looking up the answers online)? Building on from the quiz I did back in May. This time around I thought I would do another little quiz but this time focusing on the Heisei Series of Godzilla films. This time it is going to work differently due to the amount of film’s produced in the Heisei period. As only 7 films were made during the period, what will happen this time is that there will be 15 questions overall. So two questions for each film. So why 15 and not 14, well, just because it was around about the same time but not actually a Heisei film I thought I would include the 1998 film just to round the number of questions up to 15 just like the previous quiz had 15 questions. Anyway, 15 questions in a random order and not every question will have the film title in. I will post the answers up later in the week, until then grab a pen and paper or some other form of note taking to write your answers down on and enjoy. From which monster’s remains is MechaGodzilla built from in Godzilla vs MechaGodzilla II? In which film does Miki Saegusa (Megumi Odaka) make her series debut? True or False: Godzilla fights another monster in The Return of Godzilla (Godzilla 1985)? In which location is Destoroyah first spotted? Which two monsters are credited with sending Godzilla Cells into space; creating SpaceGodzilla in the process? Which monster’s remains are found at the bottom of the ocean at the beginning of Godzilla vs King Ghidorah? What is the name of Mothra’s rival/counterpart in Godzilla vs Mothra? Which building is used by SpaceGodzilla as a power source/converter? Which series regular makes a major appearance in Godzilla vs MechaGodzilla II? What flying vehicle is used to freeze Godzilla? Which Monster resurfaces out of Mount Fuji after it Erupts? What plant cells does Dr. Genshiro Shiragami combine with the cells of his Daughter? True or False: King Ghidorah loses its middle head in Godzilla vs King Ghidorah? What is the name of the fishing boat in The Return of Godzilla? What are the chances of meeting yourself, well in some cases you will have to go back in time which is a bit tricky if you do not have a time machine. In the history of professional wrestling there have been cases of people meeting each other including Kane and The Undertaker. One possibility is the idea of sending your DNA into space in the hope of it going through a Black Hole, but this could be a really bad idea as seen in this film. SpaceGodzilla is a creature from space (obviously) that is made from Godzilla’s DNA. The film also cleverly explains how this occurs, more on that later. There is some similarity but SpaceGodzilla has giant crystals coming out of his back and shoulders. He also has his own Death Ray and can also produce a shield. Here is a comparison for you to look at. The film starts with a view into space and something in crystal form like a crystal meteorite is heading towards earth. On an Island on Planet Earth some shards from this space thing land on the surface and cause some explosions which wakes up Godzilla. Meanwhile in Japan, the government are building a new Giant Weapon to replace the previously destroyed MechaGodzilla. Two soldiers are sent to an island where it is believed that Godzilla is living. When they get there they notice giant crystal formations, they are then found by a man named Yuki who has been living on the island. He saves one of them from a poisonous spider and then goes away. The 2 soldiers (Shinjo and the slightly childish Sato) go and talk to him but are then interrupted by Little Godzilla who has grown a lot since the previous film (and likes Yuki). They then set up traps for Godzilla before Yuki shows them his special weapon designed to kill Godzilla, a bullet filled with blood coagulate. On the Japanese mainland a plan has been set in motion to telepathically control Godzilla called Project T. Miki Saegusa is reluctant at first but then learns from a tiny Mothra and the 2 fairies of Mothra that Space Godzilla is coming and while Mothra has been sent to deal with a Meteorite that could destroy the Earth the planet must now rely on Godzilla. The Project T team head for the Island. Two blokes from NASA arrive in Japan and tell the government that a space monster is heading for Earth. The government launch their new weapon Moguera to attack the monster. The Moguera ultimately fails and the creature continues to head towards Earth. Back on the island the Project T team plant a device on the back of Godzilla’s head and successfully make him walk but the machine overloads itself. SpaceGodzilla arrives on the island and attacks Little Godzilla. Godzilla turns up but is overpowered by the Space Mutant. SpaceGodzilla then imprisons Little Godzilla in one of the Crystal formations that arrived on the island. SpaceGodzilla then leaves and Godzilla goes after him. Yuki and two of the scientists from Project T (Professor Gondo and Doctor Okubo) return to Japan and tell the authorities about the Monster and explain that Either Godzilla cells from Mothra or Biollante were sent into space and went through a black hole and created the Space Monster. Back on the island the following evening Miki is captured by the Japanese Mafia (Yakuza). Professor Gondo goes back to the island to pick up Shinjo and Sato and also explains why Yuki is obsessed with Godzilla, his best friend and Gondo’s brother was killed by Godzilla. The Yakuza with help from Okubo want to use the Project T to control Godzilla, however Shinjo, Sato and Yuki successfully rescue Miki before SpaceGodzilla arrives and destroys the building. SpaceGodzilla heads for Fukuoka and creates a crystal fortress around Fukuoka Tower. Yuki, Shinjo and Sato are sent to pilot the Moguera and to use everything possible to stop the Space Monster. Godzilla then arrives at Kagoshima bay and heads towards SpaceGodzilla in one of my most memorable City Attacks from the Heisei series. When Yuki finds out that Godzilla has appeared he sees this as the perfect moment to kill Godzilla. He pilots the Moguera towards Godzilla, Shinjo knocks Yuki out and he and Sato go to Fukuoka to attack SpaceGodzilla. The attack once again fails and the Moguera is almost destroyed. Godzilla arrives and begins his attack on SpaceGodzilla. The Moguera team discover that SpaceGodzilla is drawing energy from the crystals and Fukuoka Tower. SpaceGodzilla begins to use some of the crystals from his fortress as missiles against Godzilla. The Moguera team split the machine into two vehicles, the star falcon and the land tank. The Land Tank proceeds to destroy Fukuoka tower and disrupt SpaceGodzilla’s Energy. The Moguera then comes back together and uses its spiral grenades to destroy SpaceGodzilla’s shoulder crystals. Professor Gondo and Miki arrive at the area to try and help. The Moguera teams up with Godzilla to fight SpaceGodzilla but ultimately fails. Shinjo and Sato escape the machine while Yuki tries to go after Godzilla. SpaceGodzilla begins to emit energy like it is about to explode but Godzilla uses his Super Charged Atomic Deathray (“spiral fire ray”) to destroy both SpaceGodzilla and the remains of the Moguera. Miki, Professor Gondo and the Moguera Team reunite and watch as Godzilla leaves Japan, as Godzilla is leaving Miki uses telepathy to remove the mind control device and shows Shinjo Little Godzilla having been freed from its crystal Prison. Godzilla vs SpaceGodzilla is one of the oddest entries in the series but in some way it is not bad. The crystals of SpaceGodzilla that almost appear everywhere are an interesting idea but make the creature sound somewhat more like an evil villain rather than just a nasty creature. The most interesting part of the creature and its crystals are the ones on its shoulders. SpaceGodzilla’s best scenes are the ones where he is attacking the cities, well more like arriving. While the creature may look odd, it is apparent that a lot of work has been put into it in both its concept and it’s design, including how it does look a lot like Godzilla. It was both an interesting and nice change for the main city scenes to take place somewhere other than Tokyo, the Fukuoka tower is an amazing building and a great mini-co-star if you will. Little Godzilla is a nice extra, this form of a younger Godzilla shows a life-cycle of the creature from its baby form in the previous film and it’s more mature form in the following film. Little Godzilla is a whole lot better than Minilla who was just weird while this one looks more reptilian and dinosaur-ish. The Moguera (Mobile Operation Godzilla Expert Robot A-Type) is a great addition to the series. Instead of a robot it is more like a machine and relies on weapons only. Its ability to split is comparable to the Power Rangers Zord’s but the Moguera is far more impressive. Some of the film’s best special effects come from the Moguera, in particular the Land Tank and the Star Falcon. Moguera previously starred in another Toho Monster Movie, The Mysterians. But of course it comes down to Godzilla to be the main star. The previous film (as far as I know) is the first time that he used his Super Charged Atomic Deathray which returns in this film too. His city scenes and approach towards SpaceGodzilla as I said previously are some of the most memorable scenes in the series and also show how times have moved in terms of putting a living city view in the foreground and put Godzilla above them. 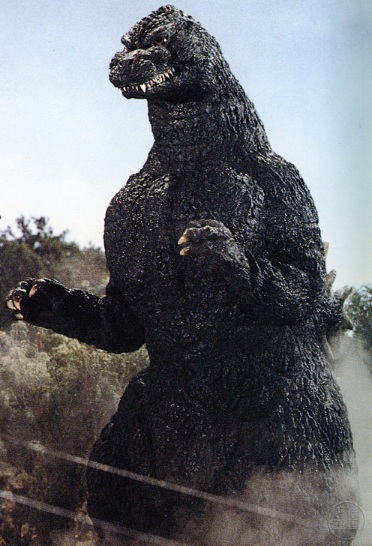 This shows his size better than when the same effect was used in Terror Of Mecha-Godzilla. The human cast are a nice blend with Shinjo and Miki equally as good. Miki has become more of a central figure than just the background as she was in previous films, she has kin do become the main star after Godzilla. The character of Yuki is Interesting but I can’t say any more than that really. But Professor Gondo (Towako Yoshikawa) is the one who really shines. A character who is genuinely a nice person who cares a lot for Yuki. It is a shame that she does not appear again in the series. It would be good though if the actress in question could receive another central role in future Godzilla films to the same style of Character as professor Gondo. Akira Nakao returns to play the commander of G-Force as he did in Godzilla vs Mechagodzilla 2. Nakao would make several appearances throughout the series in later films usually as a commanding figure, he is one of the series top actors when he plays these roles and should not be overlooked. The films tone of being slightly more Superhero element than Monster Movie does let it down a bit and this is also the case in the music, but that does not mean the music is bad. The music is quiet nice and keep a lookout for the theme of Godzilla when he is attacking Kagoshima. What is most odd is that when SpaceGodzilla begins to emit energy it is almost like he is choosing Suicide. For most of the early part of the film he has the upper hand but now he is losing he can’t stand it. The film’s ending is a bit abrupt and could be better. Godzilla vs SpaceGodzilla is a bit of a weak (mostly towards the end) film which is a shame because most of the early parts of the film are actually very good and if it could keep this pace it could have been one of the strongest entries in the series. I do sometime find myself thinking about it because I do like it, it is a bizarre entry in the series but in some way it is one of the most memorable (I do sometimes consider it to be one of the best in the Heisei series) So while it is let down towards the end of the film it is worth watching to see the early parts but also in my opinion it is not a bad film, ok it is not great but it is entertaining and enjoyable (It may be better if the producers had another go at it as long as they can keep the same cast of course) with some really good cast and really good monsters. Watch it and see for yourself, who knows you may be surprised, you may even like it, at least I do (I like it, what’s wrong with that).